A career in the rapidly growing field of healthcare often takes specialized education. Alumnus Chris Harrison, ‘16, credits the University of Wisconsin Health Information Management and Technology bachelor’s degree for his first job in the booming healthcare field. Today, he’s a health information management analyst (HIM analyst) at UW Health in Madison, Wis. For Chris, three aspects of the degree made his career happen. The UW HIMT bachelor’s degree is an online, multi-campus partnership between four UW institutions: UW-Green Bay, UW-Parkside, UW-Stevens Point, and UW-La Crosse. The degree is a dual-track program. Depending on their career goals, students choose a concentration in management, information technology, or both. Chris chose both. Chris manages data as an HIM analyst and indexes patient and provider records through the EHR. He’s also involved with ongoing analysis of HIMSS Stage 7 certification. According to the Health Information and Management Systems Society (HIMSS), achieving Stage 7 and maintaining that status, is a significant accomplishment. Since 2005, HIMSS Analytics’ EMR Adoption Model℠ (EMRAM) has tracked the adoption of EMR applications within hospitals and health systems across the US. Institutions work to complete the 8 stages (0 – 7), with the goal of reaching Stage 7: an environment where paper charts are no longer used. RHIA certification, one requirement of the UW Health HIM analyst job, is in demand at many healthcare organizations. RHIA stands for “Registered Health Information Administrator,” and only students that graduate from an institution that’s accredited by the Commission on Accreditation for Health Informatics and Information Management Education (CAHIIM) are eligible to sit for the RHIA certification exam. UW HIMT is currently accredited by CAHIIM at UW-Green Bay, with accreditation at UW-Parkside and UW-Stevens Point pending. 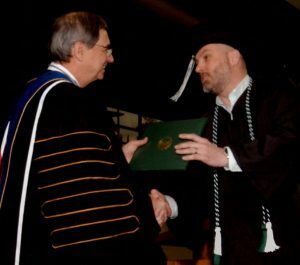 Because Chris pursued the management track through UW-Green Bay, he qualified for the RHIA exam. With RHIA exam prep materials from the HIMT 489 Pre-Capstone course, along with some study tips from his UW HIMT network, Chris was able to successfully pass the exam. Many prospective students think there won’t be an opportunity to connect to their classmates, but actually, students form professional networks that last throughout their careers. Chris said he made great connections but is especially grateful to both UW-Parkside Professor Betty Rockendorf and Program Manager Wil Limp for their guidance along his journey to the degree. Chris thanks Wil for recommending he do both tracks of the degree; the additional expertise was a bonus, opening up even more job opportunities. For now, Chris is content in his role as a HIM analyst. Longer term, he’d like to develop a specialty in business intelligence analytics. He was first introduced to the topic during his capstone course. Would you like to start a career in health information management and technology? Explore the UW HIMT degree. Contact an enrollment adviser at 1-877-UW-LEARN (895-3276) or via email at learn@uwex.edu. Which HIM Certification is Right for You? How Many People Become Registered Health Information Administrators?